Is It Wrong to Deep-Fry a Steak? Deep-frying a steak can be a culinary innovation, a method of last resort, or a bad idea. While normally you only hear about deep-frying a chicken-fried steak, it can also be used for a dry-rub seasoned steak. On an episode of one of a cooking reality show, one of the contestants was criticized for cooking a rib-eye steak in the deep fryer. The judges made a lot of indignant noises, but none of them could quite explain why they had a problem with it—they just acted like it was some sort of crime against meat. Now, if the steak was overcooked, that would be one thing. But it wasn't—at least, no one said anything about it being overcooked. Instead, they simply dismissed the very idea of it, as if no one in their right mind would ever do such a thing. Deep-frying is a form of dry-heat cooking, just like grilling and broiling. And dry-heat is indeed the appropriate technique for preparing a tender cut of beef like a rib-eye steak. Deep-frying cooks hot and fast, creating a flavorful brown crust on the exterior of the meat. As long as you don't leave the steak in the hot fat for too long, it'll come out juicy and medium rare. If you are breading or coating a steak in the batter for chicken fried steak or country fried steak, deep-frying or frying it in a deep skillet with plenty of oil is the typical way you would cook it. This is not shocking to anyone. If you wish to flout convention, you can employ a deep fryer for your steak. You may already have a turkey deep fryer available. Or, you can use a traditional deep fat fryer or a deep pan with oil. Choose an appropriate oil that won't smoke at a temperature of 350 to 375 F. Heat the oil to 350 F.
You will want your steak to be as dry as possible before you put it into the hot oil. Any dampness can create spatter. You should wear gloves and even consider wearing eye protection. It is wise to have a fire extinguisher handy any time you are working with a deep fryer, especially a turkey deep fryer. Use a rack or basket to lower your seasoned steak into the hot oil. You will need to do so slowly for a large piece of steak. How long you will cook the steak will depend on its thickness and how done you wish it to be. A 1/2-inch steak will cook in one to two minutes (medium rare to medium). A 1-inch steak will cook in three to four minutes. A thick 1 1/2-inch steak will need five to six minutes. If you are using a deep skillet, you may need to turn the steak while cooking after about half of the cooking time. Be sure to use tongs that have insulated handles. When the steak is done, turn off the cooker and remove the steak slowly so as to not spill any hot oil. 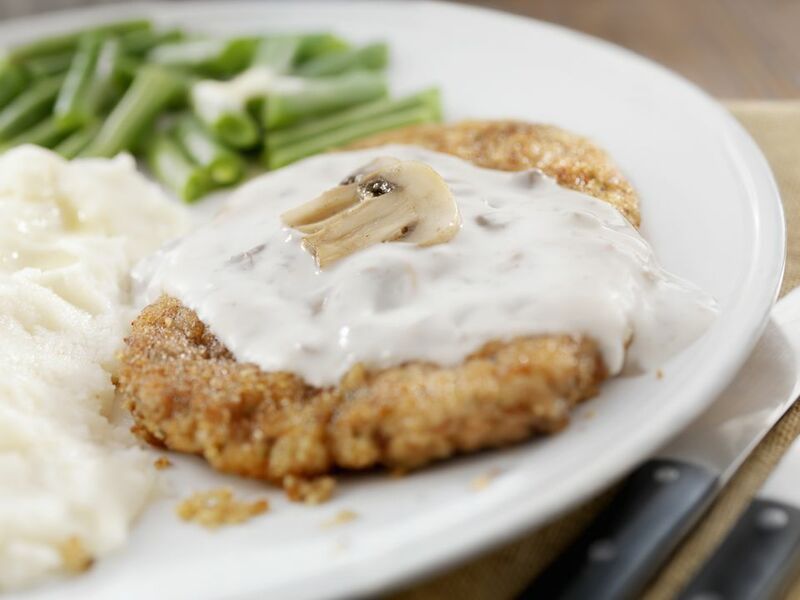 Now let your taste buds be the judge as to whether a deep-fried steak can be delicious. Do You Know How to Slice a Denver Steak?